Snow J. Monograph: Glycirrhiza glabra Leguminacae The Protocol Journal of Botanical Medicine 1996;Winter:9-14. Van Marle J, Aarsen PN, Lind A, et al. 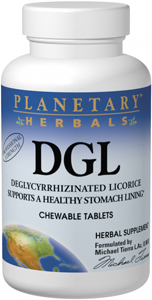 Deglycyrrhizinised liquorice (DGL) and the renewal of rat stomach epithelium. Eur J Pharmacol 1981;72:219-25.